The blinds have just been increased to 800-1,600 with a 200 ante. There are now 68 players remaining and the average chip stack is just under 76,800. The top 30 will finish in the money and play will continue tonight until approximately 1am or the final table, whichever comes first. There are now 32 players remaining in the $400 7-Card Stud event. The limits are now 600-1,200 with a 75 ante and a 150 bring-in. The average chip stack is just under 12,000. 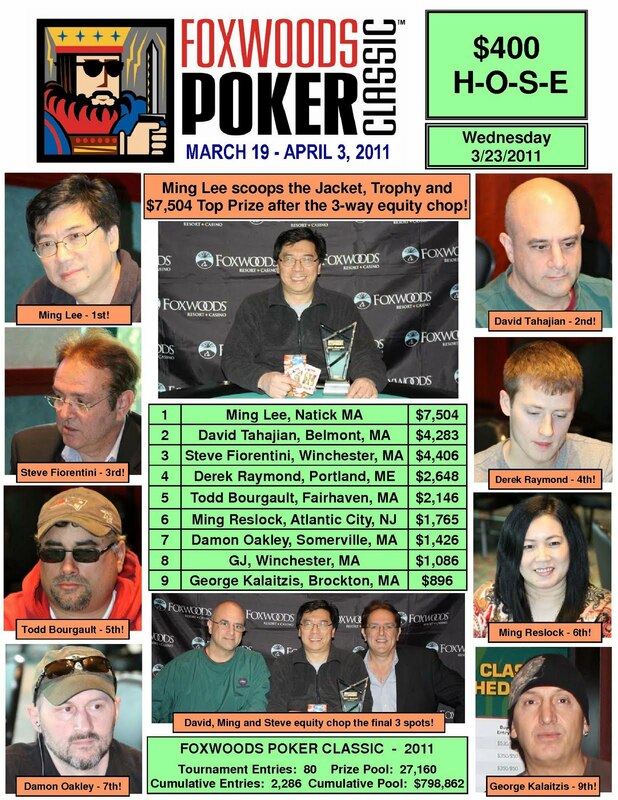 Adam Hui, who finished 15th in the February Mega Stack Main Event for $5,154, is near the top of the leader board in the $600 NLHE Deep Stack event at the Foxwoods Poker Classic. With 95 players remaining, Hui has built his stack up to around 180,000 with the chip average at just under 55,000. The blinds are currently 500-1,000 with a 100 ante. 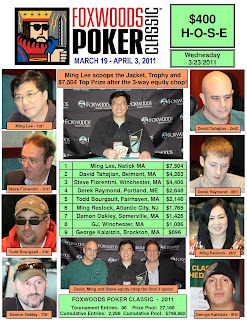 We had a total of 74 players in the $400 7-Card Stud event. 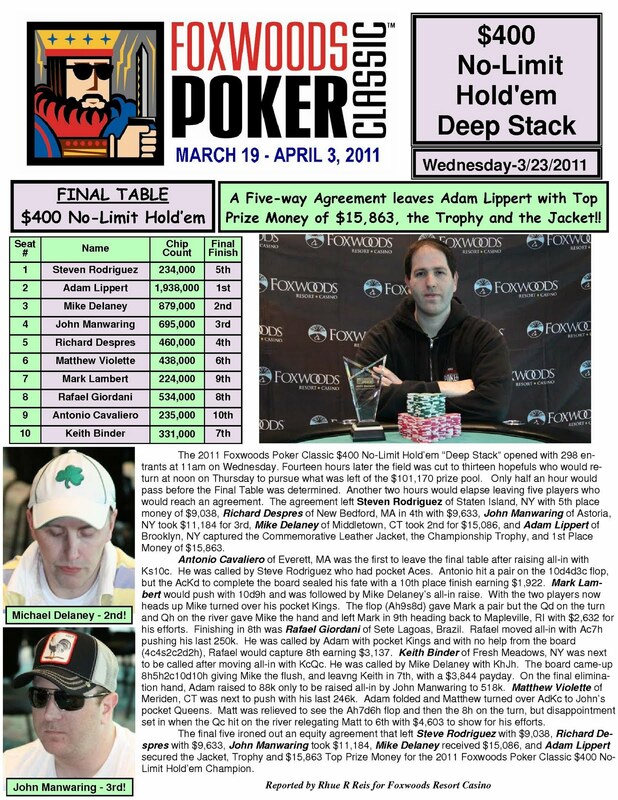 With 120 players remaining, the average chip stack is now 43,500. 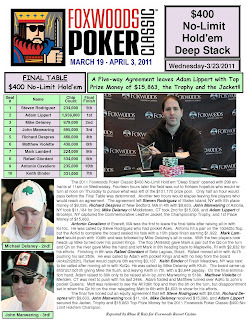 Jay WhoJedi Newnum talks about the upcoming schedule at the 2011 Foxwoods Poker Classic, including the $2,500 Main Event that kicks off on Friday, April 1st. $400 7-Card Stud Event Underway! The $400 7-Card Stud event is now underway. We had a total of 261 players in the $600 NLHE Deep Stack event. $600 Deep Stack Now Streaming Live! Since we have no final table today at the Foxwoods Poker Classic, we will be streaming $600 NLHE Deep Stack event all day. The $600 N0-Limit Hold 'em Deep Stack event is now underway. 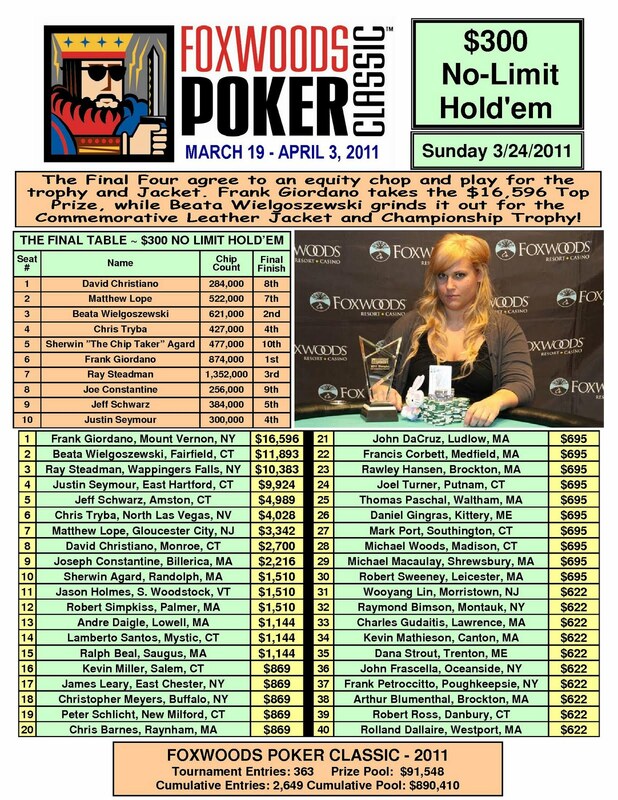 Players are starting with 20,000 in chips and the levels are 50 minutes in length. 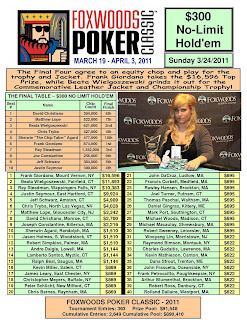 At an incredibly fast paced final table, the final four players agreed on an equity chop and played the tournament out for the trophy and leather jacket. Beata Wielgoszewski ended up winning the hardware and taking home the title!